Apple Town Story (アップルタウン物語, Apple Town Monogatari?) is a port of Little Computer People to the Family Computer Disk System. The port was released by Square in 1987 and consists of watching an animated little girl wander around her house and play with her cat. The game offers little interactivity, and there is little plot or actual gameplay. The game is seen as a precursor to Tamagotchi and Princess Maker. Apple Town Story represents the only attempt to bring David Crane's Little Computer People to Japan, at least conceptually. While the basic premise was kept the same, many details were altered to make the game fit a limited console platform, as well as a culturally Japanese audience. For one thing, without the presence of a keyboard, input was changed from keyboard hot keys and typed in requests to a simple icon driven menu bar. Aesthetically, LCP's grown man was changed to a school-aged girl, and the dog was changed to a cat. The house underwent some alterations as well, although the same basic features are present. Unlike the special production process that was used to generate unique characters in Little Computer People, every copy of Apple Town Story is identical and contains the exact same girl. She will happily move about the house on her own accord, occupying herself with various activities. You can interact with her strictly through a menu of icons which you call on to the upper right portion of the screen by pressing . Once on the screen, you can use and to cycle through the eight options, or press to close the menu. On occasion, the girl will refuse to pay attention to you, or the game will prevent you from recalling the menu. The girl is less likely to pay attention to you if she is unhappy, which can occur if she is being neglected. If the girl is thoroughly upset, she may leave the house and never return. Unlike Little Computer People, Apple Town Story does not keep an accurate clock. On the screen, you will see a digital clock which updates in five minute increments every couple of seconds. The girl's natural period of being awake is between 7 AM and 9 PM. When the girl goes to sleep at 9 PM, the first hour passes normally, and then time is accelerated until 7 AM comes around again, and the girl's alarm goes off. When the girl is awake, she will engage in different activities. Four of them will result in a special animation which replaces your regular view of the house. You can see still shots below for each of these animations. The girl can only keep a store of two packets of food which she keeps in the cupboard above the sink in the kitchen. Whenever she is down to one or none, it is your responsibility to send her food so that she doesn't run out and starve. Should she ever become hungry and there is no food in the house, she will not hesitate to let you know how upset she is. Just as with food, it is important to give the girl a steady supply of milk to drink. Unlike the food, there is no visual indication of how much milk the girl has left. You will simply see her occasionally grab a bottle from the fridge, drink it, and bring the empty bottle to the front door. If she opens the fridge and finds no more milk available, she will utter a cry that you will take immediate note of. In addition to providing the girl with food and drink, you must also be sure to supply her with food for her cat so that the cat does not go hungry as well. When you select this icon, the doorbell will ring, and she will go to answer it and collect the can of cat food you sent before pouring it out in the cat's bowl for the cat to enjoy. 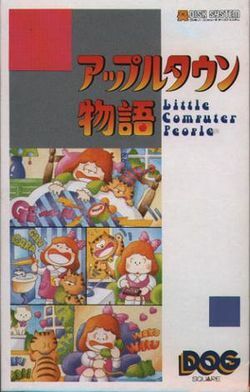 Unlike in Little Computer People where you can supply your person with gifts of records and books, the only gift that you can provide the girl with, ironically, is a Famicom game. It doesn't seem to matter how many times you do this. At random times in the day, she will take out the games you give her and play one of them until she loses. This is how you can interact directly with the girl (and her cat). You will have to change sides of the disk, and she and the cat will present you with a menu of three choices. The choices are: Compatibility test, Horoscope, and a form of Tarot cards. In the compatibility test, you provide your blood type and the blood type of someone you are interested in to see the results. You enter your birthday to get your Horoscope, and the Tarot cards are laid out until a Joker appears. Select the musical note icon in order to request that the girl play a song on the piano for you. As long as she is in a good mood, she will usually oblige and play something that she knows. If it's a new song for her, she may make a mistake or two while she plays. The house is broken into three stories. Each story has a different feature. The top floor contains the girl's bedroom, as well as an outdoor terrace. In the bedroom, the girl will sleep in her bed, do exercises, play piano, or put on a record (to which she dances in the middle floor for some reason). Out on the terrace, she may decide to water her garden, or paint on the easel. Every time she completes a painting, she will take the canvas down, and hand it on the wall in the middle floor. Don't be too surprised to find the cat sunbathing itself on the roof of the house if it manages to escape through the front door. The middle floor contains the girl's den and living room. The den is where the TV is located, which she may turn on or off, and where she will hook up the Famicom to play a game or two. When she puts a record on in the top floor, she will come down here to dance to it. The den also contains her closet where she will change clothes. In the living room, she will sit and talk on the phone, or quietly read a book which she takes out of the cabinet next to the chair. The bottom floor is primarily composed of the kitchen, and it is where the front door of the house is located. The kitchen is used for the usual purposes; cooking food, and keeping milk in the fridge. The cat's bowl is also here, and the cat will always run when he hears the girl putting food in there. On the left side of the kitchen is the bathroom of the house. She may step behind the door to use the toilet, or stand in front of the sink to wash her hands (always after painting) or brush her teeth. The game contains a number of hidden codes which can be entered with the second controller for many surprising and often humorous results. The girl falls Hold on the 2nd controller while shouting into the mic. While the girl is climb the stairs between the middle and top floor, enter this code to make the girl trip on the stairs. After the girl falls, hold both and while shouting in the mic a second time. Change the tune Press Reset while the girl plays piano. Pressing reset will randomly change the tune that the girl is playing on the piano. It won't actually reset the entire game. Rabbit Doll Press on the 2nd controller × 15, then on the 2nd controller × 15. This will cause the rabbit doll to randomly appear in various places all over the house. Chirping Bird Hold on the 2nd controller while singing into the mic. A chirping bird will appear outside over the terrace and fly back and forth for a little while. Secret Menu items Press on the 2nd controller × 20, then on the 2nd controller × 20. Two menu items will appear. A "!" will replace the heart, and a "?" will replace the note. Selecting the "!" will cause all the doors in the house to flap as if it were haunted (the girl's face will turn blue.) Selecting the "?" will cause the girl and the cat to hop across every floor of the house until all floors have been visited. Angry girl and cat Enter a bad date for your birthdate in the Horoscope. The girl and the cat will appear angry at on the interaction screen. Growing plants Tap on the 2nd controller while the girl is watering the plants Every time you tap up, one of the plants will grow a little bit. Each one will grow at roughly the same rate. Cat poo Hold on the 2nd controller while the cat is on the top floor. Quite simply, the cat will go outside and relieve himself. White Elephant Press × 13, then press . A White Elephant doll will appear on top of the television set. Strange picture Press on the 2nd controller × 5. The picture over the table in the den will alternate between the picture of a ghost and a flower. This page was last edited on 16 November 2013, at 23:44.